There’s no doubt that Easter is a big holiday for Greek-Americans. We eat roasted lamb, slow cooked whole on a spit. We go to church on Saturday evening and don’t return until the early hours of Sunday morning. Not only that, but we spend Easter Sunday with almost everyone we know! 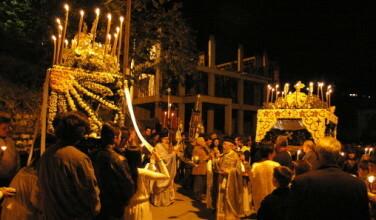 More often than not, Greek Easter takes place after American Easter. Some years the difference is about a week, other years over a month passes before Greek Easter takes place! The perfect way to take advantage of this is by buying Easter candy to go in your Easter basket. Popular choices include marshmallow candies in fun Easter-related shapes, chocolate cream eggs, foil wrapped Easter eggs, and Easter bunny chocolates. 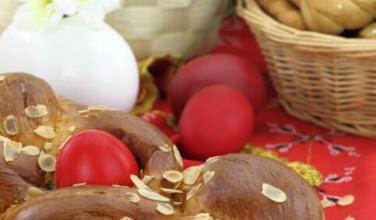 No Greek Easter basket will be complete with red Easter eggs! It is fairly rare to find a Greek Easter celebration that doesn’t have these eggs. If you don’t want to include hard boiled eggs in the child’s Easter basket, you could always fill some red plastic eggs with candy. 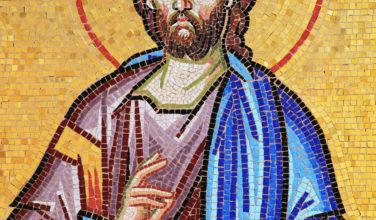 The red color still represents the blood of Christ, and the plastic egg can still represent His tomb. The only difference is that you can’t play the “egg cracking” game with the plastic eggs. Another great addition to any Easter basket are toys! The nice thing about making your own baskets is that you can choose toys that you know the child will absolutely love. Popular items include stuffed animals, outdoor games and activities, craft supplies, coloring books, and other novelty toys that you know will be a hit. For instance, if you know that the child collects a certain type of doll, you could always give a doll to the collection. If the child loves to play a certain kind of sport, you can also give him or her equipment related to that sport. If you know that the child absolutely loves Greek pastries, they make a great addition to any Easter basket! 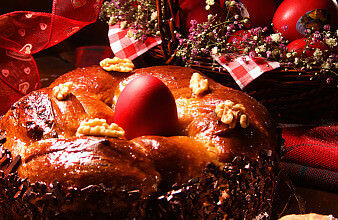 Popular pastries to eat at Easter include koulourakia, kourambiedes, and baklava. To make this part of the basket extra special, try to find out the pastries the child likes the best. Try packaging the pastries up in a special Easter-themed bag to make it even more festive. Sure, you can always buy ready-made Easter baskets. However, making them is a lot more fun because you can really choose items that will be meaningful. 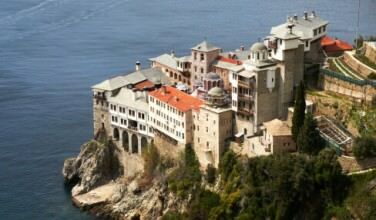 Giving Easter baskets is a great way to not only adopt an American tradition, but it can also be a great way to share items from the Greek culture.